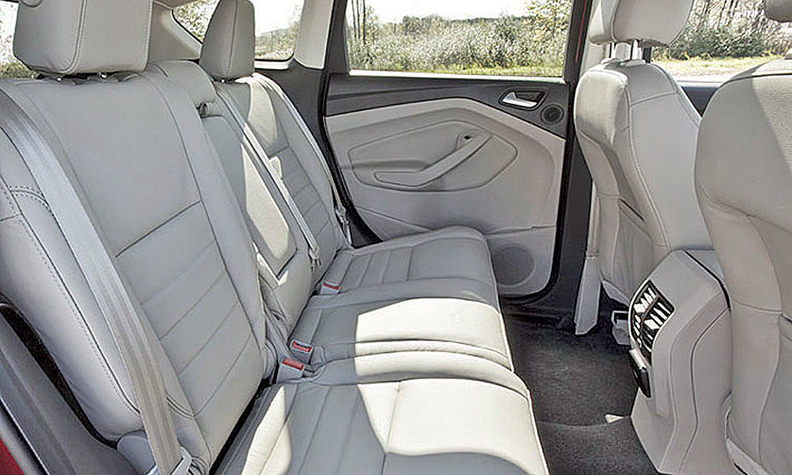 The 2013 Ford Escape's interior contains sustainable materials including soy in the seat cushions. DETROIT -- Hurricane Katrina taught Ford Motor Co. engineers an important lesson about using recycled materials in vehicles: Plastic laundry bottles don't work. When the 2005 hurricane shut down a resin supplier's factory, Ford tried using recycled Downy fabric softener bottles in car parts. But, says Laura Sinclair, a materials engineer for Ford, the company quickly learned that "if we'd put those in vehicles it would have smelled like you were doing laundry." Ford, as part of its sustainability drive, aims to build vehicles with fewer materials that end up in landfills. It isn't alone. Other carmakers have used polyester-based recycled plastic bottles. Toyota Motor Corp. uses bio-based and recycled bottles in its cars. Hyundai Motor Co. and General Motors also have used recycled bottles in concept cars as body panels. Ford's latest efforts are apparent in the 2013 Ford Escape crossover. The carpets of each 2013 Escape will contain about 25 20-ounce PET plastic beverage bottles. Ford expects to keep about 4 million bottles out of landfills annually. The interior of the new Escape also contains a number of other sustainable materials including soy in the seat cushions and fiber from the kenaf plant used in the door inserts. Altogether, 27 percent of the seat fabric comes from "post-industrial recycled content," Sinclair says. The new Escape makes the most extensive use of sustainable materials in any Ford model to date, she says. "The main mission for sustainability was to maximize the use of sustainable materials, reduce our carbon footprint, keep it out of landfills and make it recyclable at the end of the day," Sinclair says. Dash insulation includes more than 10 pounds of scrap cotton from jeans, sweaters, T-shirts and other items. The climate control gasket is made from recycled tires. The shields under the engine and transmission contain recycled plastics. Recycled materials suffer a stigma of not being durable, so Ford put the carpets through rigorous testing that involves a device called a Taber wheel. The abrasive wheel, which looks like a record player, is able to simulate five years of service in about 15 minutes. "All these recycled products have been tested so rigorously that they meet the standard of virgin materials. The end user wouldn't understand we're putting recycled products in there," Sinclair says. Ford wanted to avoid the "Fred Flintstone effect," she said, where the driver's feet go through the bottom of the vehicle. The carpet is supplied by a Swiss supplier, Autoneum Holding AG, from a factory in Bloomsburg, Pa. Autoneum was formerly the automotive systems division of Rieter Group. The 2013 Escape, which debuted at the Los Angeles Auto Show last month, will go on sale next spring.